Once again we had a near perfect summer's day for our first meeting for 2002 held at Jack and Carol Parsisson's. You must know someone in high places to be able to arrange this every time Jack. As a result the mild sunny afternoon (after days of rain and cold wind) brought out members in droves with 38 members as well as 6 of their family members attending. Informal proceedings began at 1 pm with members arriving to set up models, to display their wares for sale on the sales tables and to have a good chin wag. As always the first hour seemed to pass very quickly but our able Chairman Tony Press was able to call the meeting to order promptly at the official starting time of 2 pm. We had three visitors to welcome. 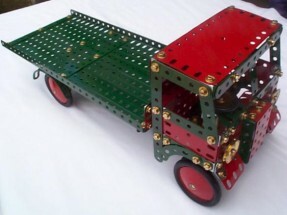 Buz Cousins has been into Meccano for many years, starting originally in England and has acquired an extensive collection over the years. Regrettably his personal circumstances preclude him from attending our meetings so he is not able to join as a member at present. Buz brought along a friend Michael Bankovski who is (severely) visually impaired but who would like to give Meccano a try. Michael is a "hands on" kind of person and compensates for his handicap by engaging in hobbies that require close up work. Our third visitor was Mike Wright an aircraft engineer who had Meccano as a boy and has re-discovered it in later life (familiar story?). But we had only one visitor to farewell - both Mike and Michael decided to join on the spot, which brings the attendance of members to 40 (have we ever achieved this magic number before?). But on the downside, sad to relate, we are losing two of our members. Wes Dalefield is leaving our shores after a stay of 16 months and has contributed much to our Club during that time. Was it really as long ago as that Wes? We hope to stay in touch, particularly thought the NZFMM web page www.dalefield.com/nzfmm of which Wes is the webmaster. Vern and Christel Ellis are also moving, but not as far, to Alice Springs - an opportunity to set up a Meccano Club in the "Top End" Vern. By way of a change, our Vice President Jim Osborne will chair the meeting of 14 April 2002. So try to get along to find out how someone else manages the show. Unfortunately we were once again not overwhelmed by nominations from those eager to participate. Graham Jost had indicated that he did not want to serve as Chairman and Kimball Monger agreed to take on this somewhat onerous task. But we finally managed to fill all 6 position as follows. Jack Parsisson reported that we have received invitations to exhibit at the following locations for 2002. Berwick District Show on 23 and 24 February. Melbourne Steam Traction Rally on 9, 10 & 11 March. Model Train Expo and Hobby Show (World Vision Centre) in November - more details later. Regarding the Steam Traction Rally, the organisers require a financial contribution towards the cost of their Public Liability Insurance. Jack has negotiated a rate of $9 per exhibitor for the 3 days and the Committee decided after some deliberation that this cost will be borne by the Club on this occasion. This is partly to encourage members to exhibit at these functions and also to recognise the very useful public exposure that the MMC Inc. obtains from being seen at them. We often get new members from such gatherings. Our Chairman, Tony Press expressed the Club's thanks to those who do exhibit for the valuable contribution they make. Guest Speaker - MMC Inc. Web Page. Paul Johnstone continued the tradition of guest speakers by bringing us up to date with developments of the MMC Inc. web page. Those who are regular visitors will have noticed some changes and improvements to the layout which facilitates navigation. If you have Internet access and are not a regular visitor then you are really missing out on something and I would encourage you to have a look. For those without ready access, remember that in Victoria your public library has free access. Just ask at the desk and the staff will get you going. If you need lots of help, try and choose a time when the staff are probably not busy - they really are in the business of providing a full library service to the public. For various reasons Paul has moved the site to a different server. It is still free but there is a limit to the space available and we will soon be reaching this limit. Rather than remove material, Paul has decided that he will decrease the size (and hence the quality) of the images that he puts up. If problems persist the server mayt have to be changed yet again! Still, one can'y expect too much from a free server! 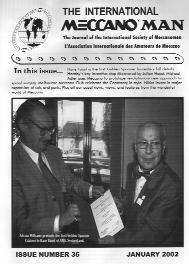 The site includes much of the content of our bi-monthly newsletters, but the web site is not a substitute for the newsletter or vice versa. In particular, there are more pictures on the web site and they are in colour which makes them much more impressive than any black and white image on paper, regardless of the quality of the printing. Paul has also included links to members' personal home pages, namely Wes Dalefield, Paul Johnstone and Jack Parsisson. 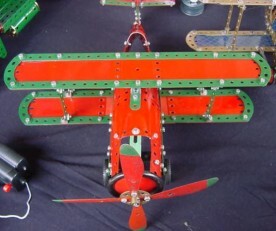 Other links are to the International Meccanoman site and to the Meccano Web Ring (http://www.meccanoweb.com/meccring/) which has links to over 60 Meccano related sites. Since 5 November there have been 358 visits to the site including many from overseas. So the web is certainly becoming an important way of making ourselves known. as the body of the mail message. Do not include a subject - otherwise Paul has to deal with the request personally, rather the "majordomo" doing it for him automatically. But be warned, the general quality will not usually be what you expect. Most messages are not related to Meccano and of the ones that are, most are "me too's". There are some pearls which can make it all worthwhile but you have to look at all messages to be sure of not missing them - the subject line is often a poor guide. The January issue featured a centre page spread about the MMC Inc.'s Centenary Exhibition, and jolly fine reading it is too. 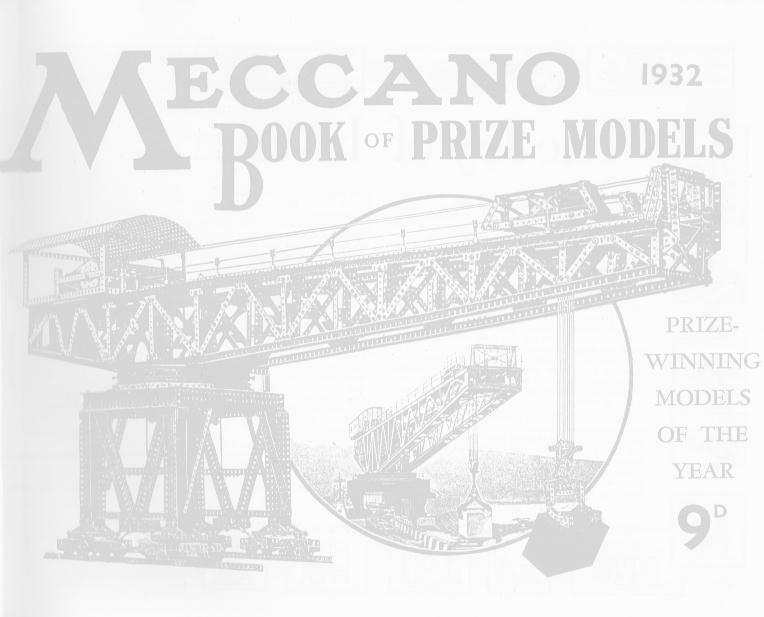 Anyone interested in joining the International Society of Meccanomen can contact our Secretary Graham Jost for details. 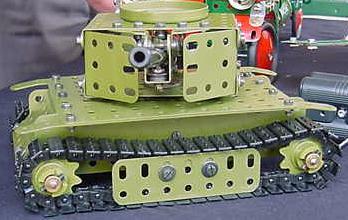 They have manufactured replica Meccano to a high standard for many years. Graham Jost has a copy of their February 2002 catalogue for those who are interested. Graham has been in touch with the manufacturers (Rovetta) who have advised that they will be offering blue/gold cross hatched plates (but they won't be cheap). 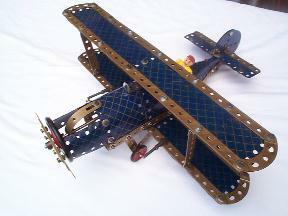 Ron Bassee has been building aeroplanes. 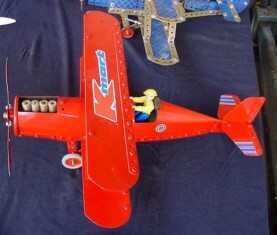 He brought along the bi-plane out of the No 4 blue/gold but decided he could better and also showed us a modified version in red/green. Not content with this, he also produced an "economy" version where instead of flexible plates he used old tins cut to shape with tin snips. The whole model was finished in bright red and was most striking. 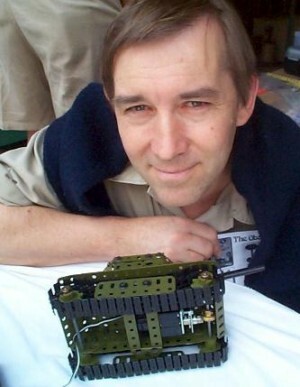 Wes Dalefield demonstrated the Light Army Tank from the 1970's Army Set, mechanised using the French motor and gearbox from the 1990's. Wes asked for ideas about a tensioning device for the tracks. One suggestion was to look at Bert Love's article in Meccano Engineer No 10 which describes the construction of two army tanks. But these models seem to only have a means for setting the tension while the model is being constructed rather than for maintaining a constant tension. Any other ideas? 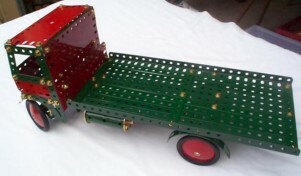 Roger Hall's contribution was the motor lorry from the No 5 red/green set. It had been constructed using beautifully refurbished parts (including the tin roadwheels) and was most impressive. As one member remarked - "we've all built that as a kid". I know that I did and it was one of my favourites. 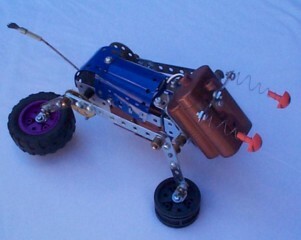 Graham Jost showed us his walking dog (which moves quite realistically) designed by Lynn Kraus (from Canada) - all genuine Meccano we are assured even down to its eyes which are from the 1978 Meccanoids set. 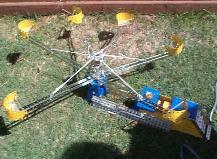 Peter During has now completed his Octopus Fairground Ride in yellow/zinc and it is fully operational. 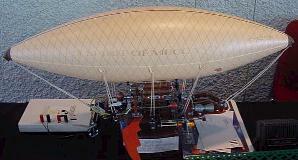 Alan Weaver brought along his model of the Airship from the Crazy Inventors series. 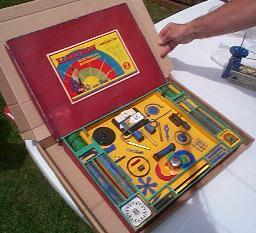 It is pleasing to see the youngsters getting into Meccano modelling. Graham Russell demonstrated specially cut compound gears that can be used to construct very compact reduction gear trains. The compound gear (see photo) is a 57 tooth gear and a 19 tooth pinion - there is no boss since the gear rotates freely on an axle. 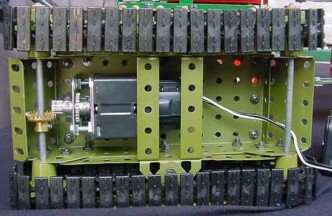 An example of an 81 fold reduction gear box is shown in the photo. A 19 t pinion on the motor shaft meshes with the 57 t gear of a compound. The 19 t gear of the same compound meshes with (the 57 t of) a second compound on an adjacent axle. The 19 t gear of this second compound meshes with a third compound rotating freely on the same axle as the first compound. 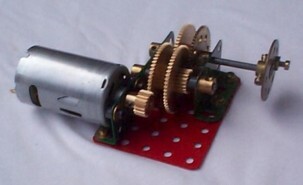 The final drive is taken by a normal 57 tooth gear. Look at the photo - it makes it much simpler. 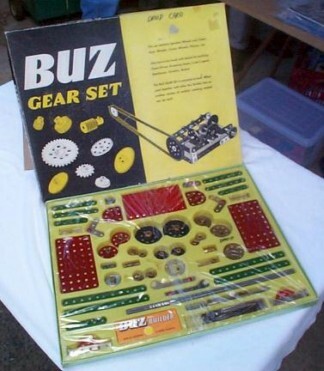 Tony Press brought along an unused Buz Gear Set from the 1960,'s - an elaborate and well presented set somewhat like the Meccano Mechanisms set of the same era. Only a few of this Buz set were made (despite the glowing write-up in The Retailer) which makes it uncommon. Alan Middleton showed off yet another of his "finds" a very nice example of a Meccano No 2 Elektron Outfit from the 1930's. Gus Kraus advises that the reception by the toy trade of the new Buzz Gear Set has exceeded his most sanguine expectations. It is truly a most engrossing product with stacks of educational and play value and I have not seen anything quite like it. In addition, the packaging is a credit with a magnificent instruction book on art paper containing simple directions and diagrams which make the construction of what, normally, could be intricate items, most simple. Gus constructed all the models illustrated in the book, photographed them, had line drawings made and wrote the text. Took him nearly a year. Glad to know that all that effort is paying off.